Nov. 12, 2014 2:00 p.m. When faced with a serious diagnosis, a young City of Leduc resident reacted with inspiring wisdom. After symptoms of constant thirst and hunger, diminished hearing and severe mood swings became a concern for her parents, Sarah O’Brien Buckley of Deer Valley was taken to her family doctor who ordered further tests. In March of 2014, Sarah was diagnosed with Juvenile Diabetes. This is a Type 1 affliction that will remain with her all her life. With twice-daily insulin injections and closely monitored blood sugar levels, her parents Mark Buckley and Gillian O’Brien can see that her symptoms have ebbed successfully. They make sure that their little dynamo doesn’t alter her busy lifestyle of sports and tap dancing at Stageworks Academy in Leduc. When Sarah’s early test results showed an alarming blood sugar level of 38.2, her parents began the long journey of learning all about Juvenile Diabetes’ and its available treatment. Although her grandparents on both sides are also afflicted with Diabetes Type 2, her parents were told that is not where the young girl’s disease came from. It is still a bit of a mystery as the world still has much to learn about Diabetes. That is why November has been designated World Diabetes Awareness Month and is critical for fundraising towards research. Educated awareness might encourage adults and parents of young children to pay attention to the telltale symptoms of this unfortunate, dreaded disease that also affects middle-aged adults. November 14 is World Diabetes Day. On Saturday, November 8th at 2pm, Sarah O’Brien Buckley who turns 7 on November 28, was invited to the City of Leduc Fire Station with her parents and older sister Niamh to help promote the Diabetes Awareness Campaign. Firefighter Rayn Cunningham had coordinated this Awareness event with Leduc Fire Chief George Clancy. Rayn candidly shared that while he is a firefighter for the City of Leduc, he is also a paramedic for the City of Edmonton, where he tends to many adults and children afflicted with diabetes. 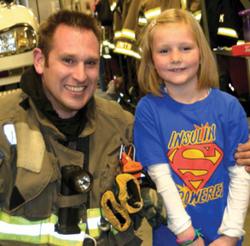 A first-time dad with a 14-months-old daughter and fond of children, Firefighter/Paramedic Cunningham was touched by Sarah’s new challenges and wanted to help bring greater awareness to this chronic illness and its critical fundraising goals. His Leduc Fire Services colleagues seemed to share his intent to applaud and support. Sporting a bright blue ‘Insulin-Powered’ T-shirt, sweet and cheerful little Sarah pinned blue Diabetes logo buttons on attending firefighters. It was a touching moment. Sarah has been chosen to be the Ambassador of the June 2014 Juvenile Diabetes Walk in Calmar. Her tireless energy and articulate passion are impressive especially at such a young age. With a chapter in Edmonton, the Canadian Diabetes Association (www.diabetes.ca) supports people afflicted with diabetes by providing information, diabetes research, education, services and advocacy, while listing the webinars, youth camps, support groups, healthy living resources and informative newsletters. A central call number also offers vital support (1-800-BANTING). As many corporations have gotten on the Diabetes fundraising bandwagon, Steeped Teas Inc. has offered $1.00 from the sale of their fruit teas named after the founders’ daughters, teas that are a colourful, healthy option for all children. For more information on Diabetes, don’t hesitate to consult your physician or visit www.diabetes.ca. Sarah wants to thank all those who have so far contributed to her fundraising efforts (http://jdrfca.donordrive.com/index.cfm?fuseaction=donorDrive.participant&participantID=224795). Happy Birthday on the 28th Sarah and continue to inspire us with your bravery and sweet wisdom.